A good host provides a haven of repose from the outside world, a peaceful space. If it functions as it should, a hospitable place allows for recline; it is synonymous with comfort and safety. Bring me your tired and your poor… It is something of a refuge. 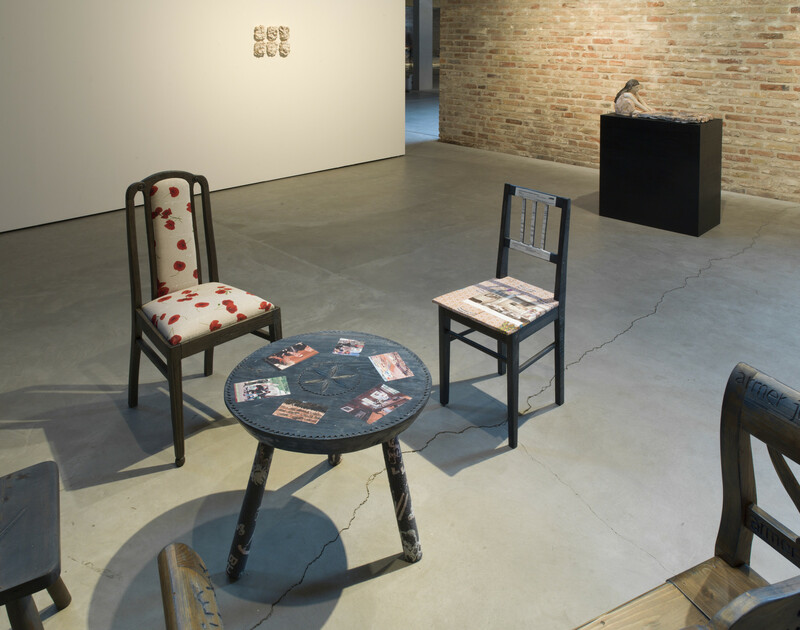 A chair is also something of a host in the most domestic, intimate and corporeal terms. 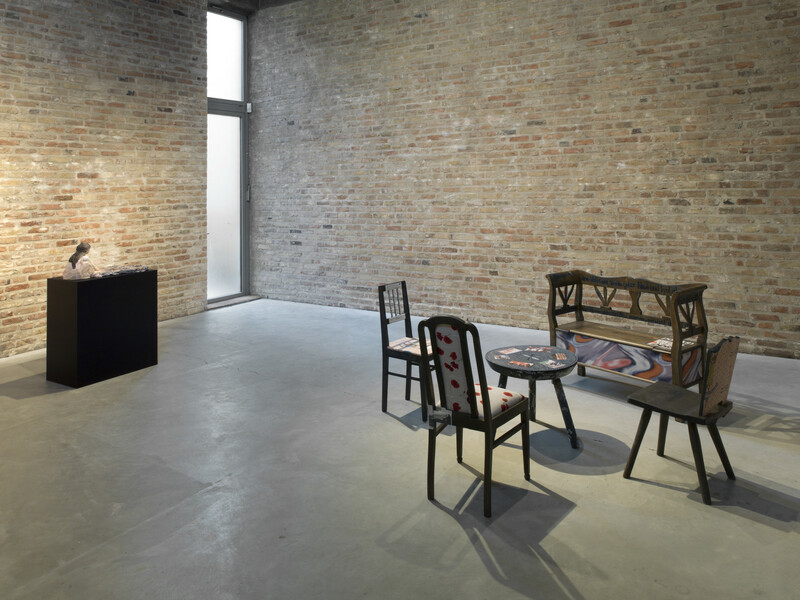 If it succeeds in its design, its sitter doesn’t explicitly notice it; a good chair in fact feels like very little. So, as it is said, a chair is a difficult object. 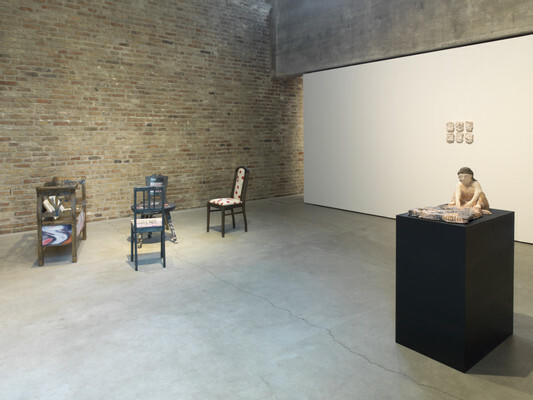 KÖNIG GALERIE is pleased to present Holle-Vanderbilt by artist Michaela Meise (b. 1976). In the chapel of St. Agnes stands a gathering of chairs and table; alongside it a ceramic figurine sits over her woven tapestry and feathered pillow-like ceramics furnish the scene. 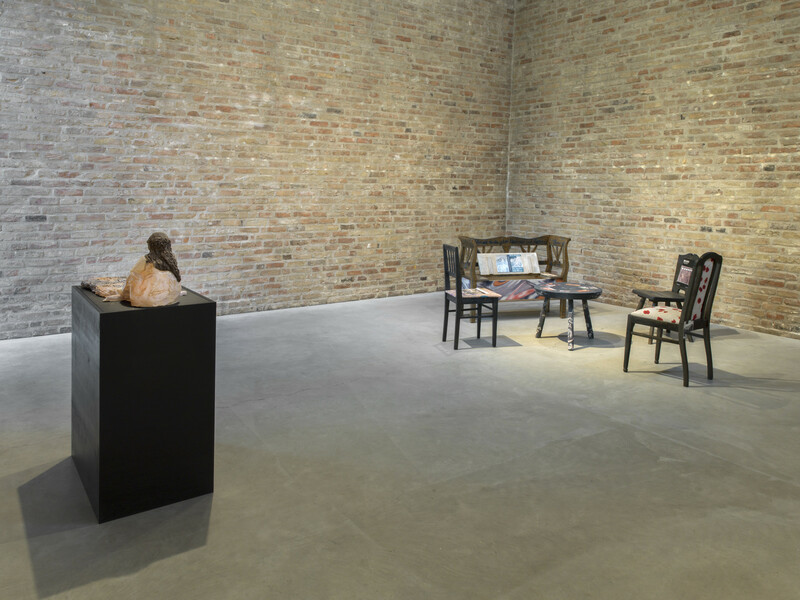 For her sixth exhibition with the gallery, the Berlin-based artist continues her investigation of the wooden object, potentialities of clay and systems for display. Through these forms, Meise brings together distinct topics that at first seem disparate or even contradictory: modern political and cultural artifacts encounter fairytale lore and celebrity-inspired décor. 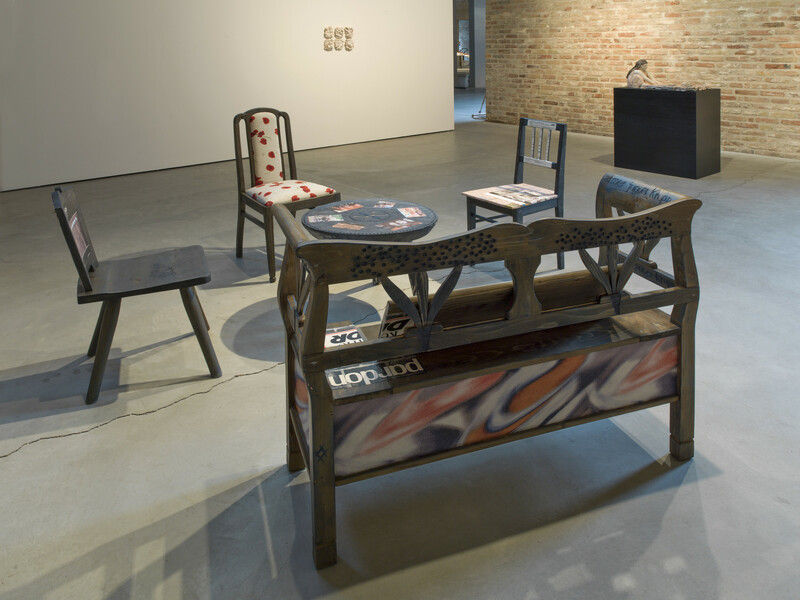 Recycled motifs and borrowed reference material are lacquered onto flea market furniture–each operating as a host for pressed Elderflowers, political ephemera, feminine fabrics or the engravings of text and currencies that decorate their surface. There is a stark directness with which Meise sticks on her cutouts; constellations created seem to bear no strict correspondence to one another and each piece also bears its own idiosyncratic design, signs of use, and specific history. Narratives crop up and then fade. Carvings recall teenage listlessness, prison wall etchings, but also hieroglyphics, so that these works become something of an archeological artifact, or an anachronistic time capsule. The specific method of textile lacquering implemented by Meise is also something borrowed. American trust fund millionaire Gloria Vanderbilt, after which the works and exhibition in part takes name, is the proverbial Renaissance woman: at once a model, writer, socialite, and designer. Vanderbilt was known for her maximalist use of layering textiles, patterns and color, and lacquering vivid fabrics onto the floor. Her aesthetic is a blend typical of American bourgeoisie and also indicative of the country home, hobbyist craft, and outsider art. Appropriated here, such a language clashes with the weight of various content: the carved Euro, a Red Army Fraction clipping, and the Krautrock lyrics your father was such a good Nazi, yet only two million a year. Among these empty seats crouches Frau Holle. 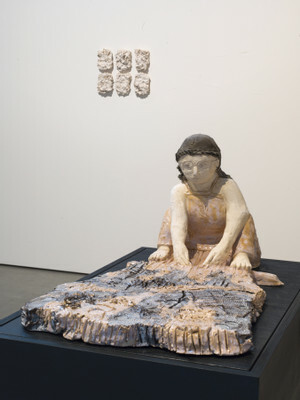 Meise’s ongoing experimentations with clay take the shape now of a Grimm fairytale, a popular German story recorded from an enduring pre-Christian legend of a destiny goddess, a determiner of fate, and a deity who shakes her featherbed over the world to make it snow. 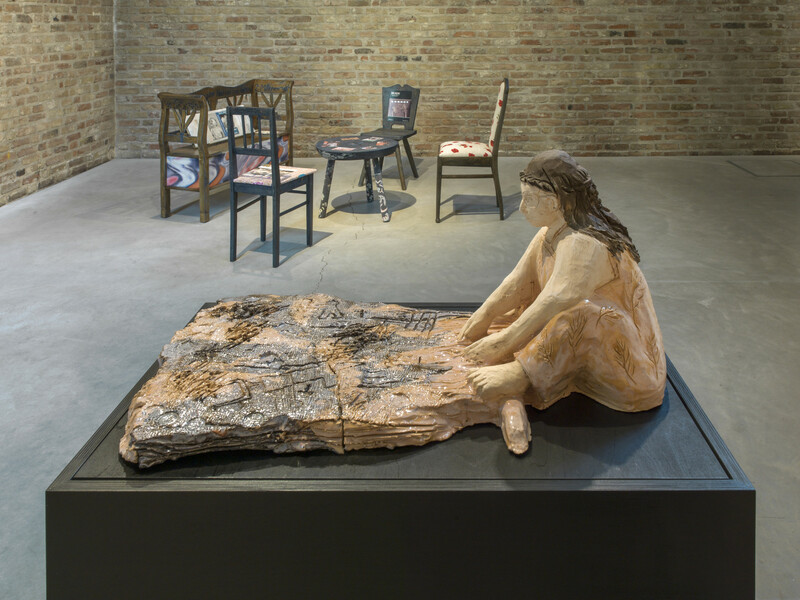 Paralleled against the imagery woven across the other works on view, Meise continues her juxtaposition of antiquated mythology against contemporary everyday narrative. Such complex relationships are also established through Meise’s titling system, where she forges new identities and lineages by hyphenating pairs of family names. Each becomes a conceptual compound, with Vanderbilt persisting as a foundational molecule. Yücel, the journalist currently in a Turkish detention, is fused to the heiress Vanderbilt through Meise’s syntax. As such, very different legacies come to an awkward and contentious head-to-head. Dissonance abounds. Vanderbilt–a name woven into the fabric of modern American mythologies. Vanderbilt–a conglomerate brand name that elicits the highest echelons of the American Dream, the one that newcomers seeking refuge might project onto American shores–a dream rapidly disintegrating. Vanderbilt–which echoes other comparable dynasties: The Clintons, The Kardashians, The Trumps; each whose inner lives and workings vividly circulate within the public imagination, shrouded in gossip and rumor, growing and shifting cumulating identities, building stories which are not unlike a myth or even a fairytale. 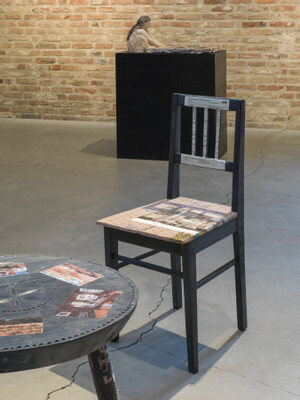 “The specificity of the challenge lies in the intimacy with which a body is to interact with a chair, an intimacy far greater and literally more pressing than between a body and a building." Stark, Frances. The Architect & the Housewife. London: Book Works, 1999, p.17. 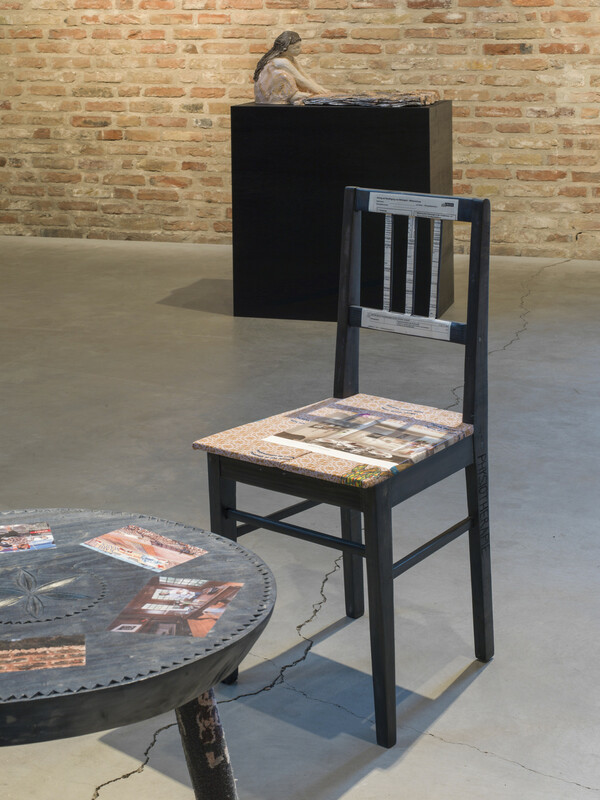 “A chair is a very difficult object. A skyscraper is almost easier,” famously stated by architect Ludwig Mies van de Rohe.